First Man is a first-person account of Neil Armstrong’s story as the first man to walk the moon. It chronicles his life as a family man who endures dangerous missions, exhausting training, sees the sacrifices men make, and embarks on a mission that could change the course of history forever. The film paints Armstrong (Ryan Gosling) as a man who is driven but emotionally distant. This disconnect is established early in the film when we see that he lost his young daughter at an early age. While he isn’t afraid to admit that it could have an effect on his job performance, Armstrong remains detached throughout the film. He isn’t one for small talk and he has only one thing on his mind. The problem is that this also puts a distance between him and the audience. Sure, he may have a reason for being indifferent and goal-oriented, but it carries on for so long that by the time that we see him become a human, it may be too late for any of us to care. Claire Foy as Janet Armstrong seems very underdeveloped. Though her character seems to be Neil’s emotional north star, it doesn’t work as her attempts to draw any emotion out of Neil comes up short. It is almost as if her efforts are futile. Making things worse is the fact that her scenes almost undercut other scenes in the film and throw off its fluidity and tone. All of this just adds to the fact that she and Gosling have zero chemistry. But there are moments where Armstrong does display a semblance of humanity as he makes jokes or cracks open a can of beer to socialize with friends. Yet he and Janet have endured so much tragedy in their lives, as noted by Janet. So it has a huge effect on the way they live and their relationship. The problem with that large disengagement is it is hard to be captivated by Gosling’s performance. He is cold and emotionally distant. So it is easy to understand why he is so stoic. In fact, it plays to Gosling’s minimalist strengths and it stays true to Armstrong. But it just doesn’t coalesce with the rest of the movie. We’ve seen characters like this in Whiplash and La La Land. Characters who make the big personal sacrifice in order to accomplish their goals. But those relationships are minute when compared to the position that Neil is in. The same can be said for NASA, whose spending taxpayer dollars and sacrificing of men can come off as superfluous. There is even a nod to Gil Scott-Heron’s “Whitey On The Moon,” which does very little to show how polarizing the NASA mission was. It almost comes off as a cheap trick to add people of color to the film. First Man does succeed from a technical standpoint. Cinematographer Linus Sandgren uses a variety of cameras that puts us right into the film. The shaky cam follows Neil and the rest of the NASA crew, while the POV shots allow you to see what the character sees. Watching Neil go into the cockpit before a launch, and try desperately to save the crew and the ship as it spins out of control is definitely something to experience on IMAX. More so when they finally land on the moon, where you get to see the grandeur of the celestial body, the emptiness of space, and how silence can be effectively used to set an emotional tone. The use of size and scale certainly puts man’s purpose of life into perspective. Wide shots of NASA facilities and rocket launches are breathtaking. It all has a big budget feel to it. It’s clear that Chazelle knows how to capture these moments to get the biggest reaction out of the audience. This especially works when it comes to the moon landing where we finally get to see the historical significance of man stepping on the moon for the first time. This is even more amazing to watch as the film switches from a 35mm to 70mm. You get the full wide scope of how the blackness of space touches the moon’s horizon. It’s simply breathtaking. The sound design and sound editing are also very impressive. In combination with the shot selections, you feel the full thrust into the movie as you hear the pieces of metal rattling off against each other during each mission, or feel the force thrust as a rocket launches into space. Then there is the lack of sound when Armstrong and Buzz Aldrin (Corey Stoll) land on the moon for the very first time. The sound of silence is profound. It’s as if the audience themselves were on the moon with the two. 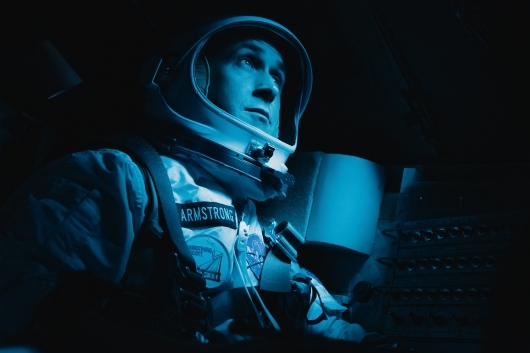 First Man is a beautiful film on a technical level that is able to put its audience in the moment using sight and sound. Yet, it falls short on an emotional level and fails to engage its audience despite the tragedy surrounding its characters. And though Chazelle’s previous characters and Armstrong are reclusive, the film forgets to build an emotional connection to its audience. That disconnect hurts the overall experience and the audience can find themselves detached from the film during some of the more pivotal moments. But if you are looking for something to watch purely on a technical standpoint, then First Man is just your kind of film.